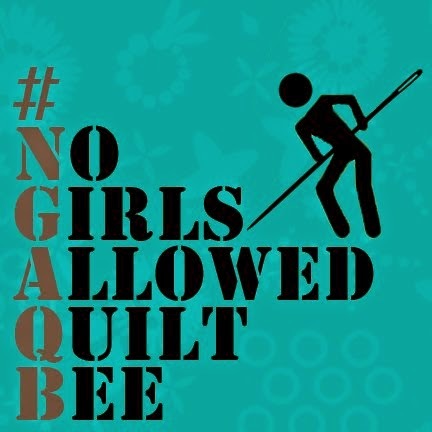 In my role as "swap swami" for the Triangle Modern Quilting Guild, I try to organize fun activities and swaps for the guild members. Earlier this summer, I introduced the idea of a pillow swap where everyone makes the same size pillow cover. By keeping the format consistent, I thought it would be fascinating to see the different directions that everyone would pursue in their designs. We decided on a standard travel-sized (12" x 16") pillow form to keep the project relatively small and manageable. I had a lot of leftover scraps of Kate Spain's Central park line and the coordinated shot cottons that I originally selected for my Carousel quilt, originally featured in issue 4 of Fat Quarterly, and decided on a half-square triangle pattern that really highlights the different colors and patterns in the fabrics. I tried something a little unusual for me, which was to use a colored thread for my quilting. I took a risk and quilted the pillow top in orange thread with an all-over meandering free-motion pattern. It certainly made the quilting pop off of the pillow rather than subtly recede into the background. 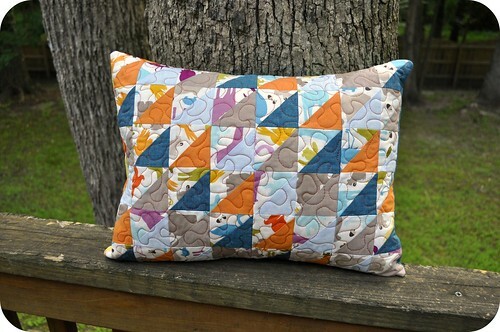 I finished the pillow with an envelope back that featured some leftover HST units and some contrasting prints. Overall the pillow was a ton of fun to make, and I think / hope the recipient (Bethany of Crafty Geeks) really liked it! Want to see what I received? Caitlin (who blogs at salty//oat) made this adorable little pillow just for me! I love Caitlin's modern sensibility and her minimalist approach to the design of this pillow. She based it on this free block pattern by Ashley of Film in the Fridge, and I feel that her liberal use of white and the carefully selected solid shades is spot on perfect. Of course, the stars of the pillow are the little Heather Ross-designed girls playing with their toy horses. Caitlin is actually works at Spoonflower (lucky girl!) and was able to score these scraps from Heather's recent line with the company. The two vignettes of the girls on the front of this pillow make it extra special for me because of the reference to my twin daughters. Speaking of my daughters, I am sure you can imagine how many times this pillow goes missing, only to be found in one of their rooms! Thanks so much for my amazing pillow, Caitlin -- it is much loved here in the Quilt Dad household! What sweet pillows! I think the colored thread looks great! I never seem to use it either. I love both these pillows. The little girls are so cute. Love both pillows. 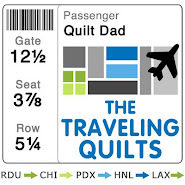 The quilting on yours is great in the color. It really looks like a puzzle board! And the pillow you received is just fantastic to. I love that horsey print! Looks like you both won in the swap! What a cute pillow. I love everything about it. And how sweet your daughters can enjoy it too. There is nothing better than that. Yes, she gave you the perfect pillow and I don't blame your girls for swiping it! I absolutely LOVE my pillow! Thanks John for not only organizing such a great swap for us, but for creating something so beautiful. It is in my office at work, and I get tons of compliments on it! Both pillows are great! I just had a DC Modern meeting this morning, and we were discussing the idea of a swap...pillows would be fun! I just gasped. It is so clean and modern, creative and whimsical all at the same time. The solids are just perfect with the print. I liked the print, but wasn't sure what to use it with that didn't look "kid" or "baby". You've sent me off in an entire new direction! The quilting complements and enhances the scale and shape of the prints and sets off the solids. Just great all 'round! 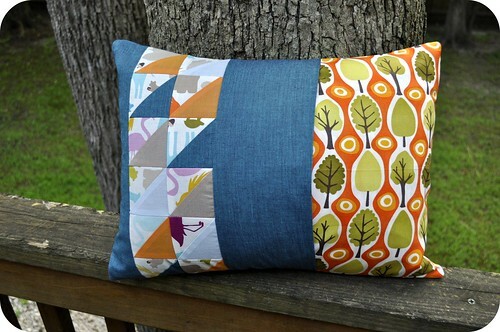 I absolutely LOVE the pillow you made and the bold, bright design of the pillow you received is fabulous. I might have to steal your idea of doing a doing a pillow swap. Sometime idea's come in the simplest of forms. Thank you so much for posting this, John! I'm so glad that you (and your girls!) love the pillow. I had a lot of fun making it, and I look forward to doing more swaps. Thanks! Wow nice! 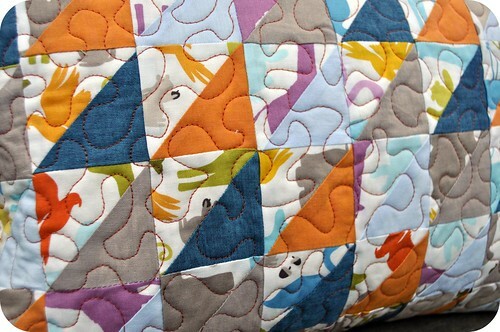 Seeing your photos makes me want to learn quilting. It must be great to make a pillow, blanket, curtain or anything for myself.